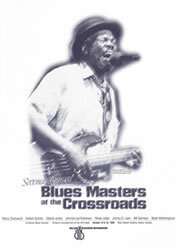 This is the poster from the second annual Blues Masters at the Crossroads two-night concert set at Blue Heaven Studios in Salina, Kansas. Each October, Blue Heaven showcases the last of the authentic blues legends. Year 1999's artists included Henry Townsend, Hubert Sumlin, Detroit Junior, Jimmie Lee Robinson, Rosie Ledet, Jimmy D. Lane, Bill Garrison and Noah Wotherspoon.